For many children in the United States, the first stories they learn involving Native Americans often include the tale of the first Thanksgiving in Plymouth or the voyage of Italian explorer Christopher Columbus. Columbus, as that story is commonly told, sailed valiantly across the Atlantic Ocean and discovered America — a wondrous new land scattered with primitive, uncivilized people. "I could conquer the whole of them with fifty men and govern them as I pleased," wrote Columbus in 1492. Of course, in academic circles, such portrayals of native peoples are viewed as one-dimensional and categorically inaccurate. To native people living today, such simplistic and widespread perceptions are detrimental. Dr. Edward A. Jolie is an assistant professor of anthropology and archaeology at Mercyhurst University. He is also of Oglala Lakota and Hodulgee Muscogee (Creek) descent. He believes that many of the misconceptions people have about Native Americans stem from popular culture. "I think a lot of public misunderstandings today come from a legacy of stereotypes perpetrated by Hollywood and old books that are full of a lack of understanding about the diversity [of] Native American peoples," he says. Dr. Benjamin G. Scharff, professor of history at Mercyhurst, agrees. "Historically, Americans have perceived native peoples in one of two ways — either as the noble savage or simply the savage," he says. "Both of these perceptions are inaccurate, as native peoples were just that: people [with] many distinctive cultures and customs." In recent decades, bestselling books such as James W. Loewen's Lies My Teacher Told Me and Howard Zinn's A People's History of the United States have helped reframe the narrative in the public consciousness — for instance, try googling "Christopher Columbus was a genocidal maniac" — but the stereotypes remain prevalent. "American Indians have been the most lied-about subset of our population," Loewen wrote. "Native Americans are not and must not be props in a sort of theme park of the past." His book, while flawed, is commendable in its call to action for more "honest and inclusive history." When history is written from a less Eurocentric perspective, it expands the narrative — and in the case of Native Americans, it is easier to view how their diverse and complex histories are essential to rather than on the periphery of American history. "Native Americans were not monolithic," says Dr. Richard Aquila, history professor at Penn State Behrend. "Tribes spoke different languages, some of which were more different from each other than English is from Chinese. … Indian cultures, food, shelter, and clothing varied depending upon geography and climate." Jay Toth is the tribal archaeologist with the Seneca Nation Historic Preservation Office in Salamanca, New York. He notes that many Americans have no idea that native peoples have occupied this land for 15,000 years. Many, he believes, completely misjudge how advanced past native societies were. "They were very knowledgeable about land management and self-sustaining agriculture, the origins of life, geometry, and science in general," he explains. The City of Erie owes its own name to its indigenous population. 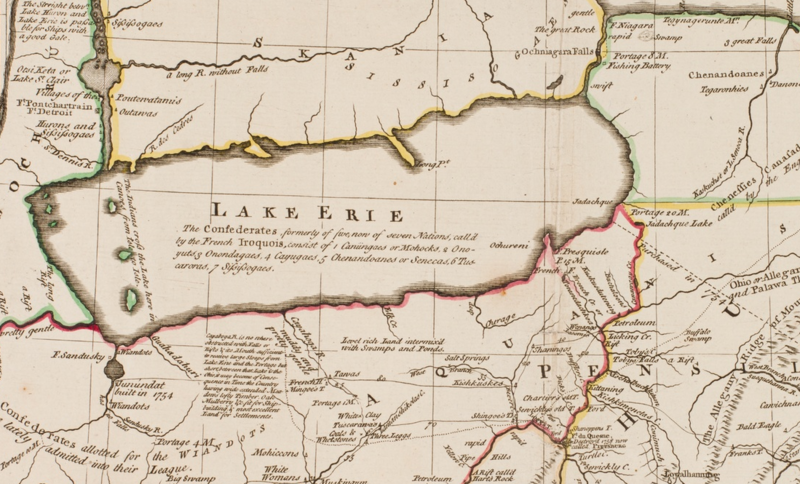 The Erie people were several connected tribes, Iroquoian both linguistically and culturally, who inhabited the lands south of Lake Erie. Their population stretched from Western Ohio, through Pennsylvania, and into New York as far east as the Genesee River. 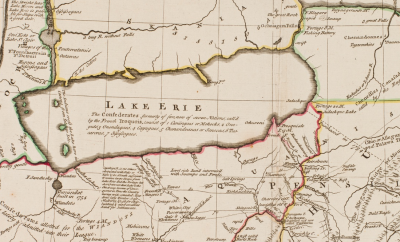 The various recorded names for the Erie people have included an assortment of spellings and pronunciations, including Erielhonan, Erieehronon, Eriez, Heries, Rhiierrhonons, Riqueronon, and Kahkwa. The French first referred to them as the Nation du Chat — or "the cat nation" — in 1632. Some have speculated that this was referencing wild panthers, pumas, or lynx that once roamed the region. Others have argued convincingly that it refers to raccoons, which the Erie people frequently hunted for food and furs. Most of what is known about the Erie people originates from archaeological evidence, oral tradition, and the secondhand writings of Jesuits, who never actually had direct contact with the Erie people. They lived primarily in longhouses along the southern lakeshore, usually near rivers or streams. One Jesuit account estimates they had nearly 30 villages and another dozen fortified towns. Their population totaled 15,000. They were experts at slash-and-burn farming techniques for growing corn, squash, and beans. They hunted deer, elk, bear, and smaller game in the dense forests and fished the rivers, streams, and lake. They ate the various nuts and fruits indigenous to the region including berries, plums, grapes, and cherries. They were the "masters of the south shore of Lake Erie," wrote Harry Forrest Lupold in his 1975 book The Forgotten People: The Woodland Erie. The story of the Erie people is long and intricate (and one that deserves to be told and heard), but their fate is what is most often remembered. The story varies by source, but in the 1650s, the Erie were led by their Queen Yagowania (also referred to as Gegosasa) and a warrior chief named Ragnotha. Following a series of conflicts with neighboring nations — kidnappings, murders, and revenge killings — tension was high between the Erie and two other Iroquoian peoples, the Onodaga and Seneca. Eventually in 1654, the opposition united with the other three nations of the Iroquois Confederacy — the Cayuga, Oneida, and Mohawk — to fight the Erie. Most versions of the story conclude with the Erie people being wiped out completely, all killed in dramatic and fierce battles and raids. The reality is that surviving Erie were scattered all over, some captured while others escaped as refugees, eventually being absorbed into other nations. "Rarely is the story ever so simple as a people were completely wiped out," Dr. Jolie explains. "Yes, there is no federally recognized Erie Nation [today], but their genes persist and they have descendants alive today, even if they or others don't use the label 'Erie.' Like any other human society, Indians met other Indians, exchanged greetings, goods, genes, and germs. … It's a reality of the human condition that shared group social identities like ethnicity are fluid and change over time." The story of the Erie people, along with the other nations of the Iroquois Confederacy, have been an indispensable part of our region's history. "Many tribes of the Eastern Woodlands of New York, Pennsylvania, and Ohio were excellent farmers, skilled hunters, wise diplomats, and accomplished warriors," explains Dr. Aquila. "The Iroquois Confederacy [nations] were among the most successful [and] had a tremendous influence on early American history." Dr. Scharff stresses that when one thinks of Native Americans, their immediate association should not be with the past. "People need to understand that the native peoples who inhabited our region are still here," he says. "Not only do we have Seneca communities just to our east, but individuals of native heritage are living amongst us [in Erie]." "Native peoples haven't gone extinct but are living vigorous cultures, carrying on traditions thousands of years old while adapting to a rapidly changing contemporary society like everyone else," adds Dr. Jolie. "If people today continue to think there are no 'real' Indians left, it's because they never were given the chance to hear Indians speak for themselves or put too much stock in Hollywood portrayals." Salamanca, New York is only an eighty-minute drive from Erie, located within the Allegany Reservation of the Seneca Nation. A museum dedicated to the Seneca opened there in 1977, largely due to fears that the Seneca's history and culture was endangered. After all, it was only the previous decade that the Kinzua Dam was built, purposefully and tragically flooding one-third of Seneca reservation land (including the historic Cornplanter Tract) and displacing hundreds. They soon outgrew their museum. The Seneca Nation opened their new state-of-the-art Seneca-Iroquois National Museum on August 4, 2018, a massive $18 million and 33,000 square-foot building that houses over a million artifacts. The new facility, open seven days a week, is designed to be a "living cultural center." 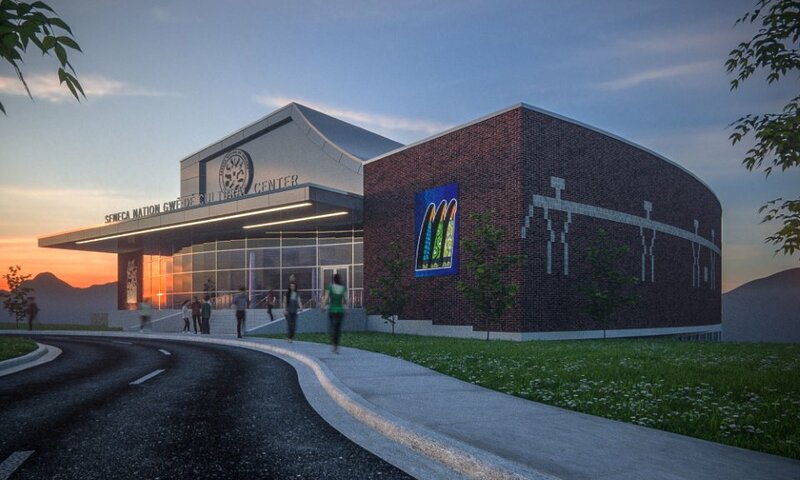 It displays an immersive presentation of Seneca history and culture through numerous exhibits. It also includes a 600-person auditorium, an expanded gift shop with native-made products, and the first Seneca-built longhouse erected since 1820. "The best place to learn more is from the people themselves as opposed to a book or someone else telling their story for them," says Dr. Jolie. "That's why this new museum is so important — it's a celebration of Seneca culture, sovereignty, and survival, told by the Seneca themselves and not someone else looking inward from the outside." Jay Toth, who is involved with the new museum, wishes there were more interaction between native and nonnative children. "The communities of Erie need to have their youth interact with Seneca youths to promote respect and understanding between the two people," he says. "Otherwise Senecas are just pictures in a book, even though they are only a short drive down the road." "I think we can do more to celebrate the richness of Indian cultures by updating what is taught to our children," adds Dr. Jolie. "I'll hope to see busloads of kids from Erie visiting the new museum in the future. I'm excited for the Seneca, but also for the diverse publics who will have this great new opportunity to learn about not just what it's like to be Seneca, but an Indian in today's America." Learn more about the new museum at senecamuseum.org and more about the Seneca Nation today at sni.org.